Are you running a Virtuemart site and struggling to find a theme that looks good, comes packed with functionality and will make your customers stand up and take notice? 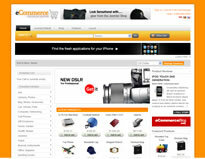 If you are, then the new theme from TemplatePlazza could be the one for you. The theme is designed to work with Virtuemart, although there is no rule saying you have to have Vuirtuemart, so it's not just if you've got a store and the theme does look really nice all by itself. However, if you are going to run this theme, you might as well start selling something and make some cash, as it will do it for you. Your online presentation is just as important as your offline one these days and this shopping theme will certainly give off the right impression to your customers and potential future ones. The theme comes with four predefined styles, nine font selections, three font size selections, a number of module positions and some extra support for a few Virtuemart addons. Want more information or a demo, click here for it.